After a less than sunny start to Spring, I am ready to be outdoors, and so is my son. But when a rainy afternoon kept us inside once again, I decided to have my son help me bake some banana bread. My son has spent time in the kitchen with me since he was born. When he learned to sit up I had him on the floor with a couple of wooden spoons. When he started to crawl and cruise I set up a bottom drawer with small kitchen wares for him to play with. As his dexterity improved I gave him a bowl with salt or flour and a spoon or small whisk to “mix” with. Over the last couple of months he’s been more and more interested in what I am doing up in the counter so I have been letting him climb on a step stool to show him what I am doing. Last week, he was a full on helper. I let him pour and mix, touch and feel all of the ingredients, measuring cups and spoons, and even though it wasn’t all perfect, it was a lot of fun and not quite as stressful as I had thought it could be. He had a blast too, and even did his happy dance, and because I almost always add chocolate chips to my banana bread, he was smart enough to sneak a couple for himself! A plastic cap from our bottle of cinnamon fell in the batter as I was helping my son measure and pour. He had no problem getting dirty to pick it up! Another skill kids learn when baking is patience, something we all need a little more of. Baking takes time, and you can’t rush it if you want to be able to eat what you spent time putting together. My kid kept checking on the oven, I had turned the light on so he could see in, and I told him each time that we needed to wait until it was done. At almost two patience is not his strongest characteristic, but he never complained about the wait. If you are lucky, you’ll have a great meal or snack after all the bonding and learning. We had awesome banana bread that he devoured. Our starting recipe, in case you are wondering, came from Smitten Kitchen. I’ve used it before, without my little helper, and it is a truly great recipe. Actually everything I’ve made from this site is amazing. 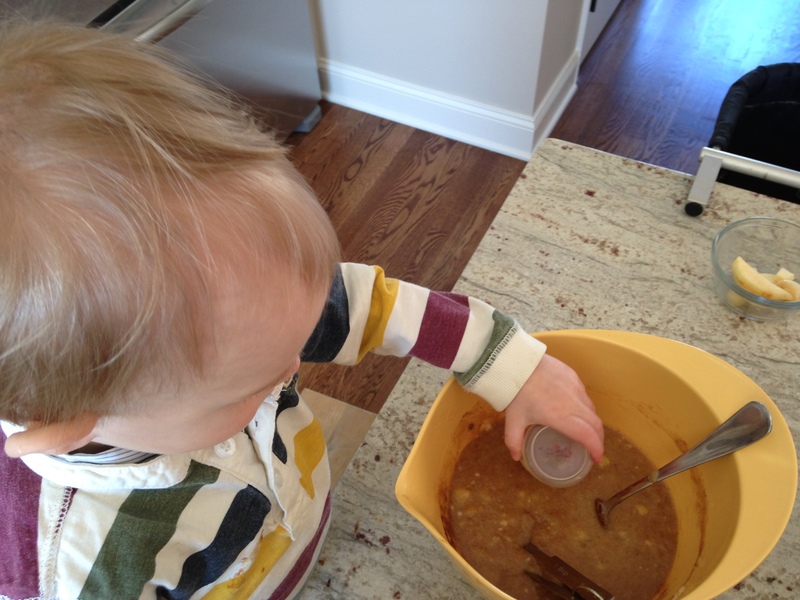 Attempting a complex recipe with a toddler would be too stressful for me, not worth it. Thanks for reading.